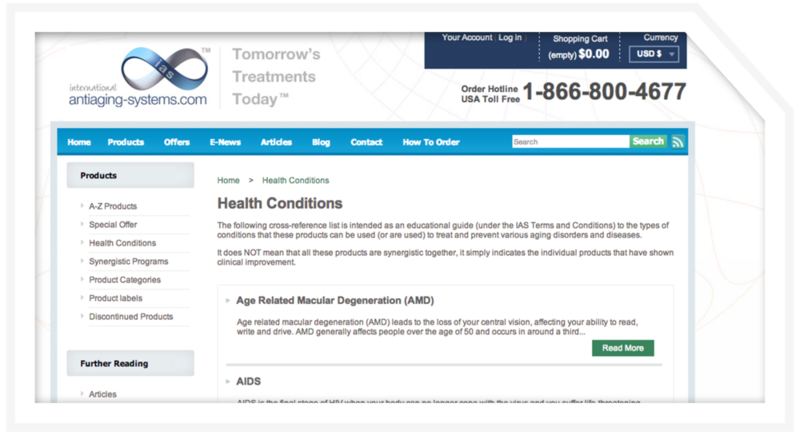 Working with one of the world’s leading suppliers of longevity supplements and specialist medicines, we provided International Antiaging Systems (IAS) with a comprehensive series of articles on categories of drugs and health conditions. Building into an A to Z reference guide, the series of articles featured an overview of drug types and health conditions and the common treatments associated with them. Help position IAS as a trusted authority for specialist supplements and medicines through a series of helpful and educational articles. Cutting through complex medical information and research to deliver clear information on common types of drugs and health conditions.